With a strong self-taught background in graffiti, graphic design and video-making, Askew One's geographical isolation being based out of Auckland, New Zealand, hasn't held him back from showcasing his work to the world. 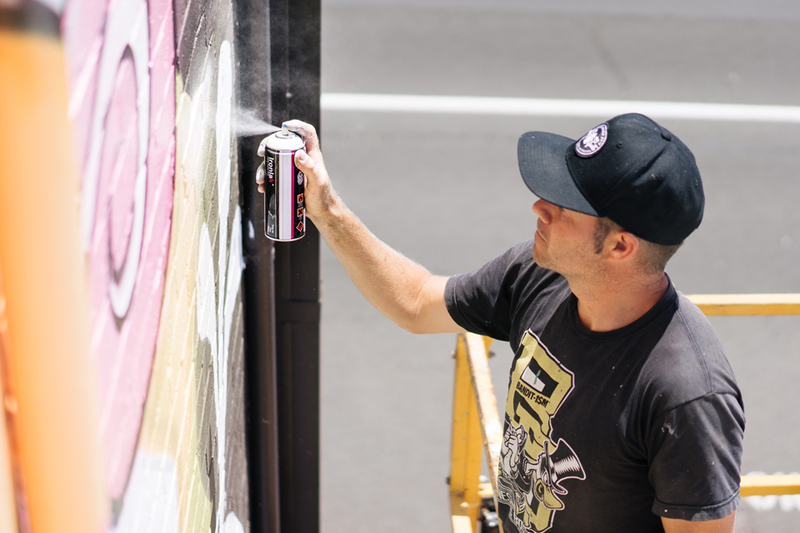 His consistency with his internet web presence over the last 12 years has made him world renowned and he is now considered to be one of the leading figures of graffiti and urban contemporary art from the Pacific region. The end result of his urban contemporary works is the product of his innovative process, which uses his skills in photography, graphic design, graffiti and traditional painting. By capturing his audience with visually complex and pleasing paintings, he is able to bring a greater story to the viewers attention. The importance of bringing to the forefront, the economic and environmental issues that are currently in place amongst the smaller Pacific nations of Oceania. Gemma O’Brien is an Australian artist and designer specialising in lettering, illustration and typography. After studying Design at the College of Fine Arts in Sydney, Gemma worked as an art director at Animal Logic, Fuel VFX and Toby & Pete before deciding to fly solo as a commercial illustrator in 2012. Her typography work takes on a variety of forms, from calligraphic brushwork, illustrated letterforms and digital type to large scale hand-painted murals. She splits her time between advertising commissions, gallery shows, speaking engagements and hosting hand-lettering workshops around the world. Her clients include Adobe, Volcom, Heineken, Kirin Cider, QANTAS, Heinz, Angus and Julia Stone and The New York Times. A number of her projects have been recognised by the New York The Type Directors Club with Awards of Typographic Excellence. In her spare time she travels and draws puke puns on barf bags for the Spew Bag Challenge. Chris Nixon is an illustrator, designer and creative director based in Perth, Australia. Inspired by the West Coast and classic surf culture with an emphasis on the handmade and crafted, his textured work and direction spreads across a wide range of media. From children’s books to animation, commercial illustration to large scale public art, Nixon threads a distinct style across all scales and sizes to extend his creativity. Chris has created several large scale artworks which have been installed around Australia and has exhibited work in Tokyo, Berlin, Bali, Sydney and Melbourne. Chris was a feature presenter at the Adobe Create Now Roadshow in Brisbane in 2014. Ian Mutch is an artist, illustrator and designer from the South-West of WA, creating detailed artworks using drawing ink, acrylics, watercolour, aerosol and markers. Ian Mutch’s artwork has won awards and given life to public spaces. His large-scale gallery works are in high demand. Ian Mutch designs and co-publishes Kingbrown Magazine and has been an industry speaker at Agideas, the Design Institute of Australia and Semi Permanent. 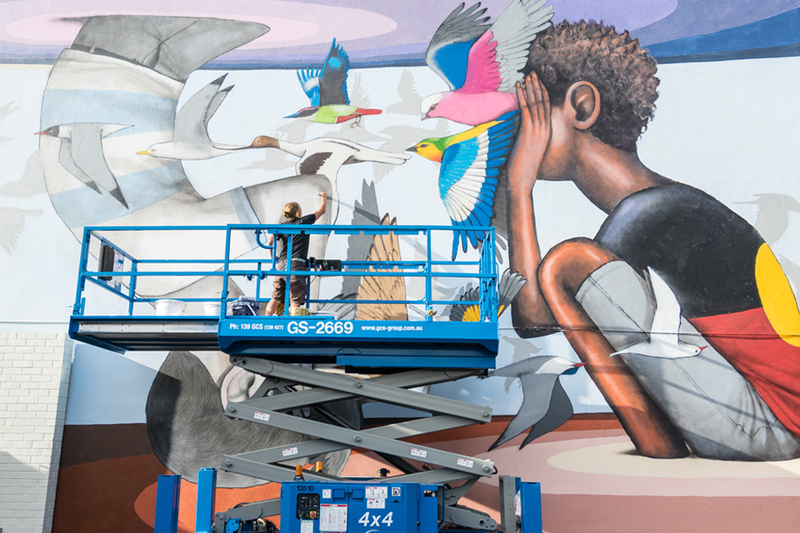 Over the past 15 years, Elliott has been showing his work and creating public murals wherever he travels. From the early part of his career, his education came from Graffiti and Street Art and he continues to practice in and out of these rebellious fields, whilst also focussing his energy on gallery work. Now showing constantly in galleries and publications throughout the world, his painting style has evolved from simple street work to complex, technical and reactive mixed media paintings and sculpture. His unique imagery has become a collage of study focussing on colour hierarchy, typography, abstract heroism and idolism within modern contemporary culture. He has shown in galleries, painted walls and sold paintings throughout the world in such places as London, Vienna, New York, Melbourne, Tokyo, Paris, Singapore, Amsterdam, Hong Kong and all over Australia. Phibs’ involvement in the Australian graffiti scene is all encompassing; he has painted so many walls around Fitzroy, an inner suburb of Melbourne, that it has affectionately become known as ‘Phibsroy’. Originally from Sydney, Phibs came from a strong graffiti background growing up painting on the train lines of Sydney’s inner suburbs with writers like. Moving to Melbourne in 2001 saw Phibs exposed to evolving Melbourne street art, where he quickly became its most respected and inspirational member. It is no stretch to say that Phibs paints walls every single day of the year, almost without exception. Phibs was the first Everfresh member to make his living solely from his work as an artist, travelling widely throughout Australia to paint commission walls. No doubt he’s painted a few pieces or tags when he’s been in your town. Beastman is an multidisciplinary artist from Sydney. Influenced by the beauty, symbolism and design aesthetics behind nature’s repetitive geometric growth patterns and organic lines, Beastman's tightly detailed, colourful, often symmetrical paintings depict an unseen world of new life, hope and survival. The instantly recognisable deities in the works have spawned from the elements of the earth, as if nature has come to life in a way we could never have imagined. One of the most distinctive and prolific emerging contemporary artists from Australia, one third of creative group The Hours and co-founder of East Editions, Beastman has exhibited extensively throughout Australia, as well as in the UK, USA, Germany, Hong Kong, Indonesia and New Zealand. He has curated and organised numerous art exhibitions and projects, has been commissioned by various brands including Element, Colab, Longview, Bose, Stone & Wood, Hyundai, Mini, Facebook and Smirnoff. Beastman was named Best Artist at the 2010 Sydney Music, Arts & Culture (SMAC) Awards and his large solo and collaborative mural works can be found all over Australia and in the UK, USA, Germany, Israel, Hong Kong, Indonesia and New Zealand. Credited for her sensitive and discerning use of colour, iconic Australian artist Anya Brock is best know for her signature bold hues, portrait- inspired animals, smouldering-faced girls and considered geometric compositions. Born in 1983 Anya was raised in Alfred Cove by Catherine and Jon Brock who owned a business repairing chairs. Encouraged from a young age to create, the ‘workshop’ provided the perfect atmosphere for a young and hungry brain. That paired with the encouragement of entrepreneurial small business owners has proved instrumental in Anya’s career. Identifying strongly with the abstract expressionists hailing from 1950’s America, Anya sees her work as semi abstracted interpretations of her subjects. Employing organic exaggeration and distortion, the work is recognisably figurative without entering realism. Anya’s connection to her subject matter varies. Occasionally the subject only provides a guide for shape and composition, a vehicle in which to experiment with paint application and emotional mark making. On the other hand her girls and nudes portray a sensual feminine strength that is beguiling and non-threatening; exposed and courageous. Hailing from a background in fashion design (she ran a successful fashion label from the ages 19-26), and boasting a resume that includes working for British fashion powerhouses Christopher Kane and Richard Nicoll, Anya moved away from the increasingly competitive fashion world in 2010 and returned to her artistic roots of drawing and painting. Finding comfort in the solitary lifestyle of painting, the jump to full time artist for Anya was considerably fast. After quickly gaining a high profile in the Australian art world Anya opened her first gallery in her hometown of Fremantle in 2013, her flagship Sydney store in 2014 and launched her home wares range in 2015. Anya’s colourful original paintings and prints feature in the interiors of Australia’s most contemporary homes and her larger-than-life murals can be found splashed across walls throughout Los Angeles, Sydney, Melbourne, Perth and Fremantle. Her budgie mural that adorned four 10-foot tall windows in Perth was featured in the New York Times. Anya now splits her time between Fremantle and Darlinghurst studios as well as painting murals and teaching workshops nationally. Artists : Brendon Norton, Kye MacGuire, Lori Pensini, Troy Bennell, Ryan Stephenson, Dee Mosca, Sim Campbell-Pope, Jackson Harvey, Sharon Hinchliffe, Time Howe & Sarah Mills. "At every crossroads in life we hear little voices. The loudness of life muffles them sometimes, but they’re still there - listen. One voice is fear and one voice is love. Trust Love. He will take you where you need to be. Look for the love, and the wonder of childhood in everything life throws your way. Recognise it and create it. That is what I believe life is about. My art is really a by-product of me figuring out which voice is which and making sense of the world around me. I hope that through my art you may enjoy the wonder of childhood and learn to listen to your little voice. Remember: trust love and ignore fear (fear is bad). "My ‘inner voices’ drive me to make art, both on a practical level but also on an emotional level. I find the process of creating like a type of therapy, to help me figure out my thoughts, emotions and doubts. When people connect with my art, they can feel the same kind of resolution and happiness too." Gimiks Born’s large scale street murals are seen on bridge pylons, underpasses and building exteriors by thousands of commuters each week. His works often set the scene for a fictional narrative - a story telling approach to street art that is driven by a love of comics, graphic novels and anime. Gimiks’ art installations not only appear throughout the city landscape, his stories are shared through illustration, canvas and digital media platforms. A Graphic Designer and Freelance Artist by trade, Gimiks has exhibited his work both in Australia and internationally. Where Gimiks' stories will take his audience is anyones guess but the journey is sure to be beautiful showcase of talent and imagination. “Roughly based in Adelaide Australia, I have been creating & painting letterforms for over two decades, which has seen me, travel around the globe consistently since 2000. Most of my influences have come from ancient scripts, Architecture, engineering, nature & the idea of movement or balance. Recognised for my attention to detail & search for perfection within letter structure, technique & life has put me in the spot light worldwide & helped to advance the way in which the art form is painted along side my other TMD members & extended family of writers around the planet. Currently the mix of sharp highly technical machine like shapes, seemingly impossible patterns mixed with a traditional graffiti aesthetic based on sound foundations are blending to produce new innovative works which continue to push the boundaries on a world scale & propel my own desires to reinvent & perfect my craft on a daily level. Jackson Harvey is a tattooist living and working Bunbury, WA, with a concurrent passion for public art and mural work. In addition to his tattooing practice, his background in architectural design and visual arts finds its expression in the medium of large-scale aerosol murals, typically featuring tattoo-related imagery and ornament.